New, luxury 2-bedroom condo in superb location - your mountain oasis! Welcome to a Top Vacation Rental winner for Canmore for 2011, 2012 and 2013 and 2014 and rated Excellent by our happy guests for 2011, 2012 and 2013 and 2014!! This luxury open-concept condo is in a superb, central location, just one block from Main Street. Just steps away from hiking and walking trails, it offers gorgeous mountain views and a patio to enjoy them from! The second-floor condo boasts a luxury, well-appointed kitchen with new stainless steel appliances and granite counter-tops: pots, pans, cooking and eating utensils provided. It offers a fridge, freezer, stove, dishwasher, microwave, washer, dryer and gas bbq, as well as small appliances like a coffee maker, kettle and toaster for your convenience. You also get access to a Parks Canada pass (should you wish to enjoy local destinations within the National Parks such as Banff or Lake Louise) for the duration of your rental. The two bedrooms feature a queen and a double bed, both with new high-end mattresses made from organic cotton. There is plenty of dresser storage in both rooms as well as a closet. Bed and shower linens are provided. Stay connected...and entertained! The condo features a high-end 42 inch LCD TV with a Blu-Ray/DVD player, a small Blu-Ray library, HD cable and an HD PVR so you can record and play back hundreds of hours of TV at a push of a button. The unit also features a stereo system, with iPod, CD, radio and Bluetooth compatibility: bring your music collection with you, listen to local radio, or stream it from your Bluetooth device. For your convenience, dedicated wireless internet and local calls are free, and heated underground parking is included. SCAMMER ALERT: We value our guests' financial protection. HomeAway and VRBO have had some phishing incidents. There have to date never been any incidents with our listing, but we would like guests to be extra careful. Do not respond if anyone contacts you to wire funds - it is most likely a scam! If you feel you may be receiving fraudulent communications regarding our listing, feel free to contact us to confirm your email communications with us, or email us. We will get back to you very quickly! Long Term Rental Opportunity: Thinking of a longer stay? We have the place for you! Our long-term rental property (28 days or longer) is an immaculate 2-bedroom, 2 bathroom condo located in the Three Sisters Mountain Village just steps from the Bow River and beautiful biking and hiking trails - and yet still only a 5 minute drive into Canmore. Included in this unit is access to an exclusive Clubhouse, with indoor and outdoor hot-tubs, gym (including free weights and ellipticals), steam room, men's and ladies' change rooms and showers, TV area, pool tables and serving bar. Contact us for details & rates on this property for your long-term rental need! We grew up in Alberta and love taking time with our family and friends to enjoy the fresh, clean mountain air and many activities available year-round in Alberta's mountain wonderland! From hiking, mountain biking and canoeing in the summer to skiing, snowshoeing and staying toasty warm by the fireplace in the winter, we love spending time in the beautiful and friendly town of Canmore! We have been lucky to have access to numerous vacation properties in the Canmore area, and this specific location is our favorite: located one block off of Main Street and within blocks of dozens of coffee shops, restaurants and more, this second-floor condo boasts one of the best locations in Canmore, away from the hustle and bustle of town and Canmore's commercial district, yet within easy walking and driving distance. It's nice, after a day of skiing or hiking up in the mountains, to be able to park the car in the heated underground stall and walk anywhere we need. It's also nice to be within quick walking distance of the nearby Bow River and the easy paths that run along it (if we're looking for a more laid-back day!). We've gone to great lengths to make this our home-away-from-home - and you'll experience the benefits yourself! Whether it's enjoying the many small appliances or spices for your gas bbq creations to our entertainment systems (stereo, TV, Blu-Ray with small movie library, board games, cards, and much more), you will be able to enjoy the benefits of home while nestled between the majestic mountains that surround Canmore. Welcome! Large walk-in shower with high quality soap, body wash and shampoo provided. Unit heating and electric fireplace! Non-smoking, no pets allowed, no renters under 25 please. Additional fees apply for long-distance telephone calls or Shaw-On-Demand movie rentals. Local calls are free. Great location; beautiful new 2 bedroom condo. Great weather! Property owner Brenda was very helpful and responsive. Highly recommend! Great well equipped property, easy walking distance to coffee shops, restaurants and amenities. Clean and welcoming. Very clean, comfortable, clean and quiet & the Welcome bottle of wine a wonderful gift. This was our best stay in Canmore ever!!! We will pass this on as THE place to stay in Canmore. The place was GREAT! Thanks Brenda for everything! The location could not have been any better....everything was very convenient. We didn't hardly use a car to go to restaurants, pubs and such. it was an amazing area and very beautiful. We did 4 or 5 hikes in Canmore, Banff, and Yoho. We hope to go back again sometimes, and we will stay here again if it's available! The drive to Banff and Lake Louise was not bad at all. We drove to that area daily. We LOVED staying here. Lovely modern apartment, secure building, full kitchen, comfy beds and great view from balcony. It was an easy drive into Banff and surrounds. Fantastic pizza restaurant (Rocky Mountain Flatbread Co) across the road. Awesome stay. We highly recommend. Fourteen miles from Banff and 45 minutes from Calgary, Canmore is the best kept secret of the Canadian Rockies. 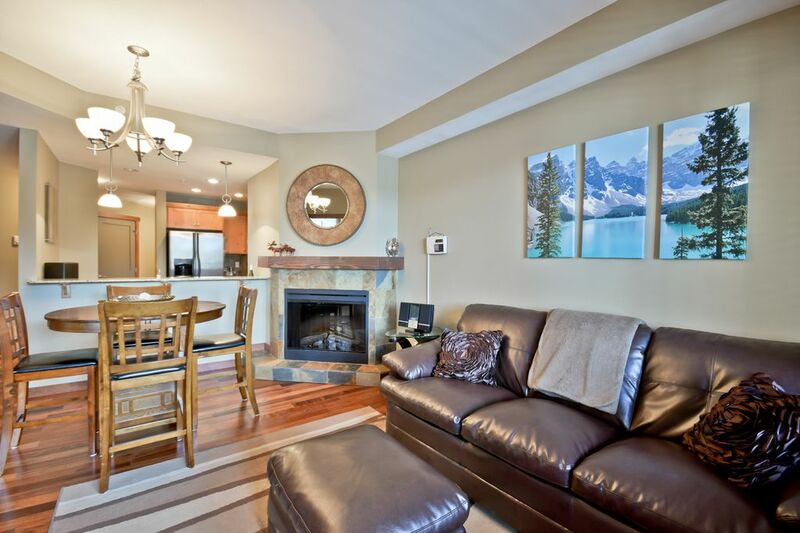 Our mountain getaway is a new condo located in the heart of Canmore one block from Main Street. The central location gives you unlimited access to this quaint town and the natural beauty surrounding it, while offering all the comforts of home...and more! With easy access to the city's commercial hub and grocery stores, yet far enough to enjoy the tranquility, this condo is a perfect home base to explore this beautiful town and its pristine surroundings. Whether you're here to explore or partake in some of the many local activities and sports, or to just relax and unwind from the stresses of life, the choice is yours. Immerse yourself in nature and relaxation...you deserve it. Minimum rental nights apply. - A reservation and damage deposit is required. - Rates are subject to change until booking confirmation is received.